4K is one of the technologies that have taken the longest to actually reach the market. So these 4K laptops are quite welcome news. There’s really not that much to say, obviously the screens are amazing. If you thought the retina screens on the macbooks were good, then these will blow your mind. They have full 4k resolution 3840 x 2160 as opossed to 2880×1800 retina resolution. Besides the ultra HD screens these laptops aren’t too shabby. The P55T has an i5 processor, a 1TB harddrive and 1792MB Intel HD graphics card. The Tecra W50 has an i7 and a 2GB NVIDIA Quadro K2100M. 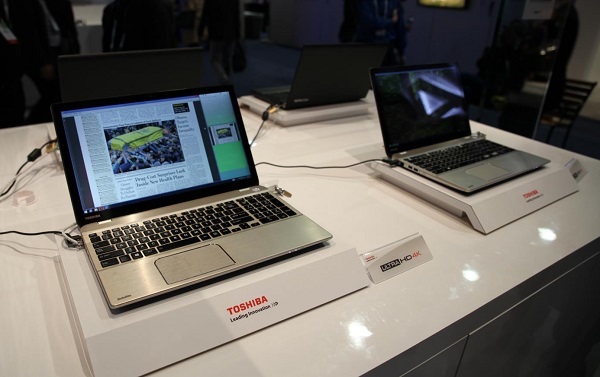 LAS VEGAS, CES 2014, LVCC Central Hall Booth #10926 – Jan. 6, 2014 – Toshiba’s Digital Products Division (DPD), a division of Toshiba America Information Systems, Inc., is showcasing today the world’s first laptops featuring Ultra HD 4K displays during CES 2014. The Tecra W50 mobile workstation is ideal for engineers and 3D designers and the Satellite® P50t for professional photographers, graphic designers and 4K movie enthusiasts. Both laptops will be available for purchase in mid-2014. The 15.6-inch diagonal displays1 of the Tecra W50 and Satellite P50t deliver native 3840 x 2160 resolution at 282 PPI. To further enhance the viewing experience, the displays are also color calibrated with accurate color gamut and feature wide viewing angles. A portable powerhouse built for the most intensive visual and engineering tasks, the Tecra W50 mobile workstation features a 15.6-inch diagonal Ultra HD 4K display, plus unsurpassed durability and one of the thinnest, lightest designs in its class at less than six pounds. The Tecra W50 features high-precision performance for today’s most demanding tasks – including SolidWorks® and AutoCAD®– with a full-voltage 4th generation Intel® Core™ processing technology2. Packed with premium features and sophisticated styling, the Satellite P50t is designed to kick mobile entertainment into high gear with a responsive touchscreen display and a powerful 4th generation Intel Core processor. Available with a 15.6-inch diagonal Ultra HD 4K display with edge-to-edge glass that provides unprecedented color, clarity and contrast. The Tecra W50 and Satellite P50t with 4K displays will be available in mid-2014. twitter.com/ToshibaUSA, and on YouTube at youtube.com/ToshibaUS. Next: How Much Do You Walk At The CES?